'Zomtober' may be officially over, but here at 'Awdry Towers' the undead refuse to lie down! As I eluded to in my previous post, the half term break has afforded me some much needed hobby time and I'm thoroughly enjoying wielding the paintbrush again after a month of self imposed abstinence. Like a good many, I have been bitten with the 'Zombicice' bug. Although a late devotee to this collaborative board game, I have subsequently picked up the core set and add ons that are currently available, not to mention backing the recently funded Season 3. Again, like a good many, I was taken by the quality and originality of the sculpts and have always wanted to find out for myself what they were like to paint. Having selected three of the much maligned 'Fatties' there was the simple task of tidying them up, removing some of the mould lines. * The plastic used, is not so receptive to a file, but a scalpel or sharp craft knife will certainly do the trick. *I say simple task, but I have noticed, on closer inspection, that I missed some - drat! The next decision was what to do with the bases? Some web based research threw up a myriad of possibilities, but being inherently lazy, I decided to keep the original bases intact and threw on some clutter to give them that apocalyptic feel. This included some Vallejo Red Oxide Paste for a tarmac texture and the newly discovered Vallejo Mica Flake Gel to break the surface up a bit - I first saw this been used on James Wappel's truly inspirational site - James Wappel Miniature Painting. Resorting to my favoured black undercoat spray to prime, I was ready to splash some paint on them. No when it comes to colours, I find it difficult to move away form previously established palettes and having seen so many examples of these very models wearing orange boiler suits or green and pink dresses it was perhaps inevitable that these were the colours I reached for when it came to working on my own. I have to say that they were an absolute joy to paint with enough detail to keep me interested and being a little larger than a true 28mm scale there was plenty for my tired eyes to focus on. The paint seemed to adhere well, with no obvious flaking and the final application of gore helped to tie them in to the rest of the horde. This experiment has really opened my eyes to a seemingly endless array of possibilities. To be brutally honest there is no way that I can lavish this much individual attention on the remaining zombies,** yet there are possibilities for conversion and perhaps this will ensure that a good many more of this relatively inexpensive source of undead plastic reach the painting table. **There are just too many of them! I'm sure I've seen them in town on a Friday night! excellent work as usual on those zombies. Especially the pale greenish skin turned out perfect. That's the part I fear most when considering painting zombies. To my mind healthy skin is much easier. I think I agree with you Stefan, ridiculous amounts of blending required on these, but ultimately worth it. They are frighteningly realistic. They look just like the denizens of my local highstreet come 11 am or Saturday morning! They probably have better personal hygiene though! Thank you so much Clint, I think I've met the same on our high street too! Awesome job on these sir. Zombicide is going to feel a little too real if you keep this up! Thank you Mike, but I've just looked at the mass of unpainted plastic in the spare room! Thank you so much Roy, I surprised myself at just how much time I gave these. I simply could not help but immediately think of zombified versions of those less than savoury "Viz" characters, "The Fat Slags". Stunningly gorgeous skin colours - How do you paint them like that as I could swear you can see the bruising beneath the mottled skin? I couldn't agree more, I had the exact same duo in my head when I was painting them. Stunning. The contrast between the flestone and the pink & green really works well. Thank you so much, particularly as your work is such an inspiration to me. great job as usual, they are terrifying! Thank you Luca, I'm glad you like them. Excellent job Michael! That skin tone is magnificent. About time with the Zòmbicide. Thank you Bob, there are certainly plenty more to work on though! 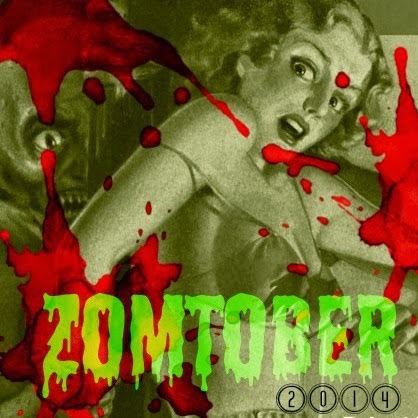 Great work on these and your other Zombtober entries. Thank you so much Sean, hoping to get one more entry in this afternoon if all goes well. Great work! Really like the flesh tones especially since they gave you a large canvas to work your magic on. Thank you Brian, certainly the size allowed the blending to work for me this time. Very nicely done Michael. I love the colours you've chosen for the clothing it contrasts very nice with the flesh tones. The bases are excellent. I shall have to investigate these new techniques you've used. Thank you Simon, the Mica gel is a curious thing and I would definitely recommend reading James' observations first - very useful. Brilliant work on them! It would definately be quite a chore to paint up all the zombies from the core game and additions. But all of the minis in that quality would definately be very nice to have. Thank you and I think you're right, but I might manage a few more yet. Lovely work Michael. James blog is chock full of ideas. One of his recent posts on using Vallejo water gel mixed with red paint to represent blood caught my eye. Thank you Mark, I think I missed the gel for blood post, I'll definitely have to check that one out - thank you. These are beautifully done Michael. Your skin tones for zeds is marvelous and I like the colours of the ladies dresses. Sorry I've been absent but my Father In Law has been in and out of hospital for much of the month. Life is a bit hectic but I'll try to do better in future. Thank you so much Anne, I'm just sorry that you haven't had better news. Best wishes to you all. Another fantastic batch of miniatures Michael..now you've got me wanting to dabble more with my bases, but then your comments at the end smacked me back into reality. Lavishing the bases of ALL those Zombies would be a chore indeed, but it does indeed break up the monotony. Will see what I can do. The bases themselves are relatively quick, just the red oxide for texture and a few bits and pieces really, it was the skin tones that took the time. Great figures with lots of character and beautifully painted. Those wenches are going to need one hell of a lot of make-up t6o pull ! Thank you and you might be right, not that I ever want to find out! Once again, the stuff of nightmares! Fabulous brushwork, Michael. Oh, and I just placed an order for Vallejo Mica so thanks for the tip! Thank you so much Monty, do check out James' site with regards to the Mica, it's curious stuff but he certainly makes it work for him. Lovely work there Michael and I do thing that are the best of the zombies that you have done. Thank you Pete, I was certainly really thrilled with them although at one point I though the mix might have been a little too blue. They are great. you've made a real rod for your back in starting to paint these though. Thank you Mike and you might well be right - not sure I will ever get them all done, but perhaps a few more anyway. Those 3 need to lay off the beans......human beans that is! Great minis! Thank you so much J.D. that's very kind of you to say so. Thank you Drue and I loved your collection - puts my small horde to shame! Great job with the bases! I hope you post a tutorial of them sometime! Thank you very much, I must see if I can sort something out next time I get them on the table.